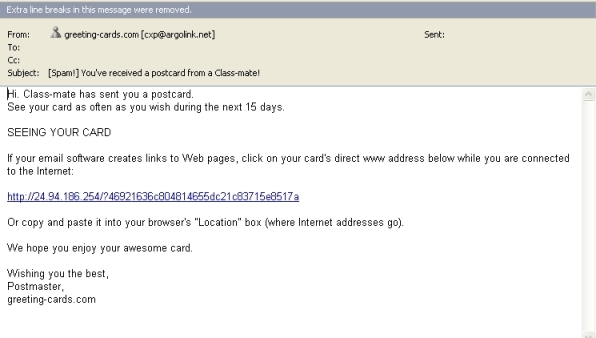 Internet users need to be more careful when receiving an online greeting card. The online greeting card might just be another spam mail that attracts users to click to a computer virus link. This is the latest trick created by internet spammers to attack users’ email inboxes and to get users to install malicious software on their machines. According to an email security company, Postini, it has seen about 275 million such messages since July 2. In most cases, the subject line of these spam mails informs recipients that they have received a greeting card or a postcard from a “friend,” “family member,” “worshipper,” “school-mate”, “neighbor” or “neighbour.” When the e-mail is opened, there’s a link to a Web site that uploads a virus to the recipient’s computer. Generally, it is very common to receive online gift, greeting cards, online photo albums, etc from friends or family members. Hence when internet users receive these spam mails, the level of suspicion is relatively low and it stands a better chance to get users to click on the virus link. Online Greeting services providers has warned users on these spam mails. They remind customers do not simply click on a link. It is better to retrieve legitimate greeting cards by going directly to the company’s site.